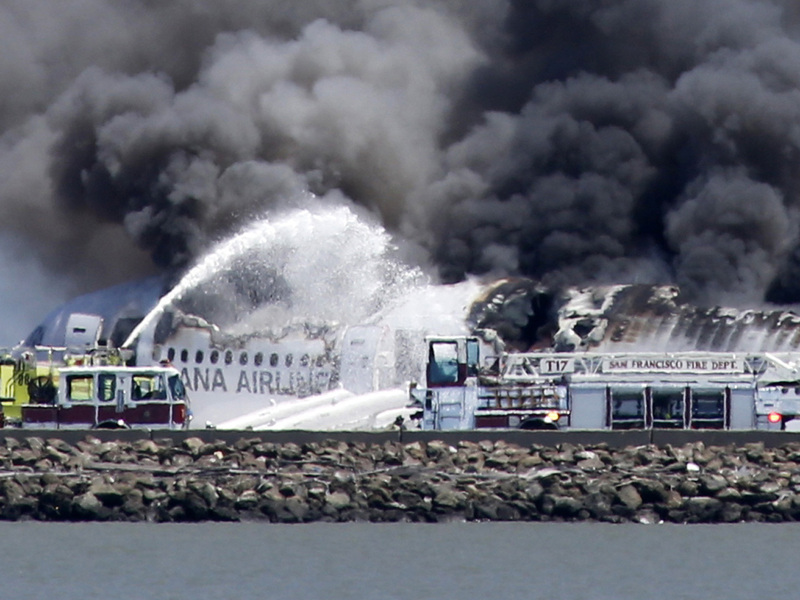 Emergency phone calls made by some of the passengers aboard Asiana Airlines Flight 214 reveal the chaos and confusion that unfolded Saturday when the plane's rear end crashed into a seawall at San Francisco International Airport. On Wednesday, the California Highway Patrol released audio excerpts of emergency calls made when the Boeing 777-200 crashed on the runaway, killing two teenage Chinese girls and leaving many more people injured. "We just crash-landed on the airline, and it looks like help's coming but not too many ambulances," said one male caller. When the emergency dispatcher asked if there was anybody trapped on the plane, the person responded: "I think the majority of people got off. I tried to stay back, but I think there were at least a handful of people behind me before everyone was telling us to get out." Another caller at the airport told a dispatcher that she just got into a plane crash and that there were not enough medics at the scene: "There is a woman out here on the street, on the runway, who is pretty much burned very severely on the head, and we don't know what to do ... she is severely burned. She will probably die soon if she doesn't get help ... she needs help ... how do I- is there any way we could assist her?" Another woman who said she was on the plane told a dispatcher she had been on the ground for 20-30 minutes: "There are people laying on the tarmac with critical injuries, head injuries. We're almost losing a woman here. We're trying to keep her alive ... we've been on the ground and not seen one ambulance the whole time." The calls showed how dispatchers tried to get as much specific information from passengers as possible. "Hi, we're at the San Francisco airport, and our airplane just crashed upon landing, and I think we need someone here up here as soon as possible," the male caller told the dispatcher. "OK, what runway are you at?" the dispatcher asked. "What's that?" the man asked. "Are you at a specific runway?" the dispatcher asked. "I don't know the runway," the man said. "We literally just ran out of the airplane." On Wednesday, federal safety officials said one of the pilots on the flight initially told the crew not to evacuate passengers after it crashed. The National Transportation Safety Board said Wednesday that people did not begin fleeing the aircraft until 90 seconds later, when a fire erupted. At that point, the doors were opened and escape slides were inflated. Two flight attendants were pinned by slides that inflated inside during the impact. As CBS News correspondent John Blackstone reported, NTSB chairman Deborah Hersman said it was one of the flight attendants who insisted passengers had to start getting off the aircraft. "He could see fire outside of the window," Hersman said. "He sent the flight attendant who was sitting with him up to the front of the cabin to let them know that there was fire and that they needed to evacuate." Officials say the delay occurred as the pilot checked with the tower at the airport. CBS News aviation consultant Capt. Chesley Sullenberger, who piloted the "Miracle on the Hudson" jet in 2009, told "Evening News" anchor Scott Pelley that the flight attendants were following their training, which is "to contact the contact the cockpit and ask for direction." "It was important to note," Sullenberger added, "that the flight attendant ... immediately saw fire on the right side and communicated that to the front and recommended evacuation so that it could take place quickly." About why the pilots would insist that everybody stay in their seats, Sullenberger explained that some number of seconds were needed "to assess the situation and make sure that it wasn't more dangerous for them to immediately evacuate into an unknown situation than to remain on board. Of course, it's also important to notice that the flight attendants, of course, have the ability to immediately begin the evacuation when they determine that the threat exists and it's an immediate danger, or if they can't contact the pilots."